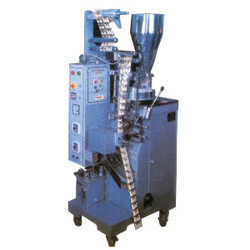 Pioneers in the industry, we offer ffs oil packing machine from India. We are dependable manufactures & suppliers of the finest quality FFS Oil Packing Machine. The offered packaging machine is designed by using quality approved materials with the help of professionals at our end. This packaging machine is stringently examined on various quality parameters for assuring flawless range. We offer this packaging machine in numerous stipulations as per the needs of customers. Looking for FFS Oil Packing Machine ?